An online police operation to identify alleged thieves has led to a 95 percent drop in theft, claims the PSNI. Police in Craigavon started posting images of suspects they wanted to speak to about various types of theft including shoplifting. Many of the images published on PSNI Craigavon’s Facebook were from CCTV with police asking the public to help identify them. Over several months and many images, the PSNI Craigavon regularly voiced surprise at how quickly the people in the photographs were identified. And now they claim that since the programme, crime has also plummetted. In a post on their Facebook page, the PSNI said: “When we started Op Exposure a couple of months ago, we knew we’d hit a point where we’d catch up with ourselves. By that I mean we’d reach a point where we had put all the images out of outstanding crimes and were now running live time, with no backlog and only the most recent incidents to use. “Whenever we were in discussions, I made the point that we could wait until we had a batch of images, then run Op Exposure for a week at a time. 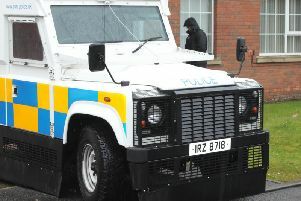 “What I hadn’t foreseen is the impact it might have on crime itself,” said the PSNI officer. “See we’ve gone from a point where we had maybe 15-20 theft incidents in Craigavon/Banbridge area per day...to having only two over the whole weekend! “Now, we’re not going to be arrogant enough to state that Facebook has cut shop lifting by...whatever percent that is. “We don’t know what exactly the reason is. “We do know that it’s not in keeping with other areas. “It may be because Op Exposure is now acting as a deterrent. It may be pure fluke. “Whatever the cause, it’s a good thing! It’s left us with only a handful of images that Sergeant Gaz and his team have to check and get signed off for release, and then we’ll use them. “After that, it’s a tumbleweed moment! “This is not the end of your involvement with crime fighting. “Come the new year, another ‘first’ will be launched on this page which I’m sure you will love...and criminals will hate. Who knows what it will be? !